Y'all I feel like I need to give myself a pat on the back for being able to get a blog post up! Seriously though, I apologize again for my absence. Moving across country is ROUGH. 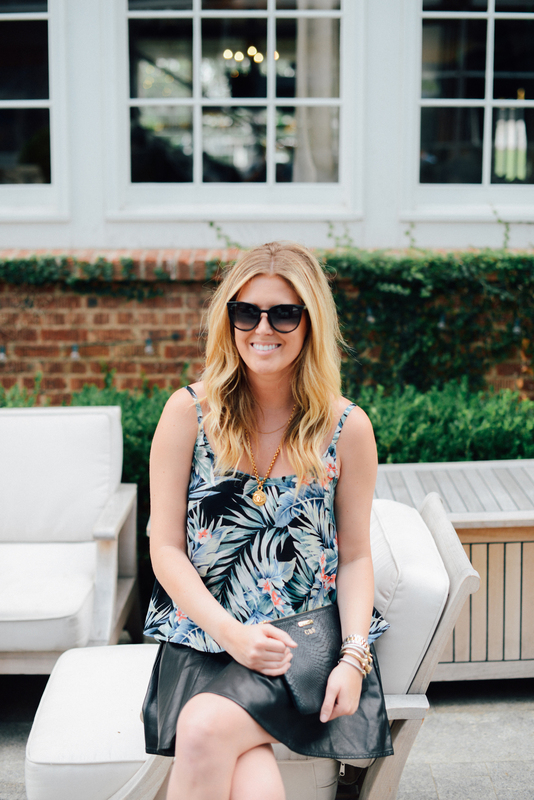 Anyways, how amazingly cute is this palm print top? I randomly found it at Forever 21! They always have the best "trendy" stuff which is great when you don't know if the trend is here to stay. This top would look so cute with denim cutoffs, white jeans, regular denim, you name it! It's so perfect for summer! I decided to shake things up a bit with this top and pair it with my favorite RAILS leather skirt (which is now on MAJOR sale!!) Leather is not just for fall y'all. I love the way the top looks paired with this A-Line skirt. Since the top is also slightly A-line/flouncy it almost makes it look like this outfit is a two-part dress! To help juxtapose the heavy skirt, I also added my favorite Espadrille Stuart Weitzman wedges and my favorite vintage Chanel necklace.